no skill required, but a strong back is needed to wrestle the concrete parts into place. 1. Use a pointed spade to remove all the topsoil from the area. 2. 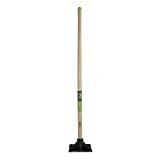 Cover the area with a mixture of ¾-inch crushed stone and stone dust; rake the stone smooth. 3. Use a hand tamper to compact stone base. 4. Add more crushed stone to bring it level with the surrounding grade, then compact the area again. 5. Spread stone dust over the crushed-stone base, then compact it with the hand tamper. 6. Check the stone base for level. 7. Set the cast-concrete base into place and check it for level. 8. If one end of the base is low, add some stone dust underneath, then check again for level. If necessary, use a rubber mallet to pound the base into level alignment. 9. Set the fountain's basin on top of the concrete base and check it for level. 10. Place the solar-powered submersible pump inside the fountain's basin. 11. Stake the solar panel into the ground a few feet from the fountain; be sure the panel is facing south. 12. Run the power cord from the pump to the solar panel. 13. Insert the rubber plug into the hole in the basin to seal the power cord and prevent water from leaking out. 14. Hold the fountain's top over the basin, and have a helper feed the pump hose through the top's center hole. 15. Set the top down onto the basin, making sure it's centered. 16. Fill the fountain's basin with water. 17. Bury the power cord in a shallow trench, then plug power cord into the solar panel to activate the pump. 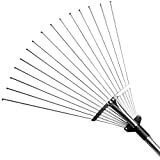 gonicc 63 inch Professional Adjustable Garden Leaf Rake, Expanding Metal Rake - Adjustable Folding Head from 7 Inch to 22 Inch. Collect Leaf Among Delicate Plants,Lawns and Yards. Ideal Camp Rake.